The Center Club is a platinum ranked city club located in the heart of downtown Baltimore’s Inner Harbor. With over 2,000 members it is also one of the largest clubs in the area. Chef Bob has been running the kitchen at the club since 1998 and constantly provides the members with new and exciting dining options. Chef Bob was born and raised in Baltimore, Maryland. He originally wanted to make a career in the military, but as he grew older he found his interests shifting. He wanted to work in a fast paced, physical environment while being able to make people happy. Chef Bob cites Charlie Trotter and Marco Pierre White as his main inspirations. Charlie Trotter revolutionized American fine dining in the ‘90s and Marco Pierre White was the youngest chef in the UK to attain three Michelin stars as well as blend passion and attitude in producing some of the finest French and British cuisine in the late ‘80s, all things that Chef Bob aspired to emulate. 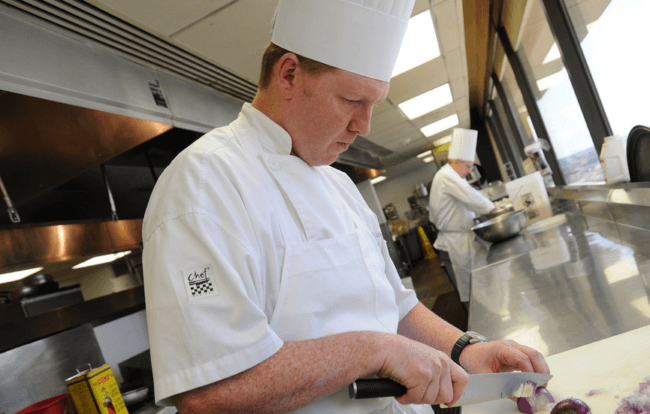 Chef Bob attended the Baltimore International Culinary Arts Institute, graduating in 1987. While at school, he worked in the kitchen of Good Samaritan Hospital. Upon graduating he took a job as sous chef at Angelina’s Restaurant, a famous Baltimore City landmark for Italian cuisine and crab cakes. He would stay there for five years and then in 1992 he first took a job at the Center Club. In 1994 he moved to Vail, Colorado to work at a high end Austrian hotel called the Vail Village Inn. During his time as sous chef there, Chef Bob was exposed to all aspects of classical European cuisine. He had the opportunity to work with the freshest ingredients as well as local wild game and produce. He made pates and terrines as well as smoked all the salmon for the hotel. In July 1997 he returned to Baltimore and went back to work at the Center Club and was promoted to executive chef in 1998. He has over 33 years of experience in the kitchen and has not slowed down or looked back ever since. In the late 1990’s Chef Bob was fortunate enough to travel to Chicago for a stage with Charlie Trotter at his world famous restaurant. He also had the opportunity to work with Wolfgang Puck. Being a chef at a private club has many advantages and this is one of the reasons Chef Bob has had such a long and successful career. He has trained many young chefs in his kitchen who have gone on to jumpstart their careers under his tutelage. He encourages his young chefs to experiment in the kitchen and really cook the kind of food they are interested in. In his spare time Chef Bob enjoys mountain biking, hunting, yoga, movies, and cooking at home. He also enjoys traveling and trying to new restaurants to bring inspiration back to the club. At the end of the day Chef Bob enjoys making his members happy and this is probably why he is on a first name basis with many of them while also obliging the many special requests he gets each and every week.